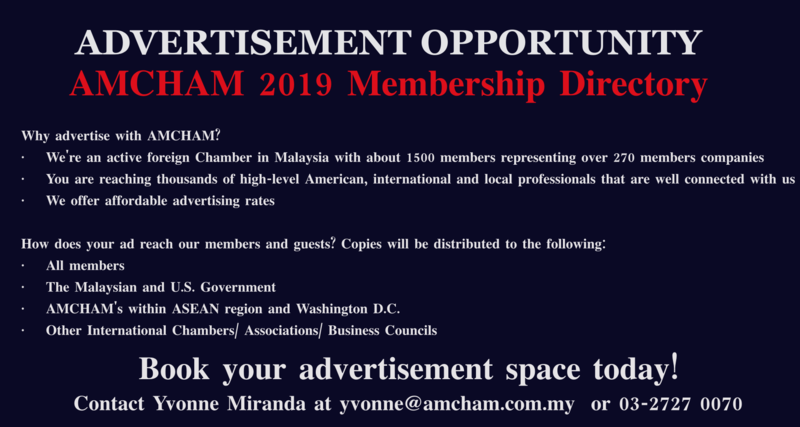 As an advocate for its members’ interests, AMCHAM raises key issues and concerns with the Malaysian and U.S. Governments, and has gathered information on policy issues to promote trade and investment between both countries. Through Industry Committees within AMCHAM and through working one-on-one with Chamber members, AMCHAM helps to identify important regulatory issues that impact operations and foreign direct investments in Malaysia. It works with members to develop white papers and communications strategies to share with Government officials on the types of policies that can further help grow Malaysia’s economy and foreign investment opportunities. AMCHAM works very closely with the Malaysian Government, participating in dialogues and roundtable discussions to provide information on American business investments, to advice on regulatory policies and to raise issues of concern to AMCHAM members. The Chamber has a close partnership with the U.S. Embassy in Kuala Lumpur, and with key U.S. Government agencies in Washington, DC (e.g., Department of Commerce, Department of State, Offi ce of the U.S. Trade Representative, etc.). AMCHAM also advocates for the interests of Americans living abroad, including on the issue of U.S. citizens being taxed overseas by the United States. The Malaysian American Electronics Industry (MAEI), an industry sub-committee of AMCHAM is the single largest committee representing the Electrical and Electronics (E&E) industry in Malaysia since its inception in 1989. MAEI aims to enhance member/government relations, highlight members’ contribution to the Malaysian economy and advocate changes and improvements needed to elevate the competitiveness of Malaysia. The Malaysian Alternative & Renewable Industry (MARI) Committee works closely with the Malaysian Government on issues concerning the renewable energy industry. It supports the creation of a renewable energy economic cluster and accelerates the growth and expansion of the renewable energy industry in Malaysia. With over cumulative investments of RM7 billion from 3 member companies, deploying highly advanced manufacturing technology on ground,; this committee actively promotes the potential for Malaysia as an ideal destination for ASEAN’s regional solar hub.